The latest 1D laser displacement sensor from MTI provides excellent speed and accuracy for even the most difficult applications and provides data output and power through a single USB cable. 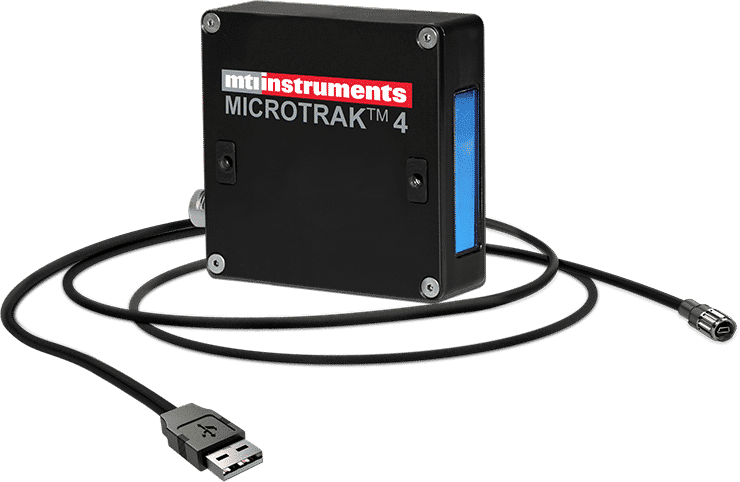 The MicroTrak 4 is the ultimate 1D laser sensor for measuring height, thickness, displacement, vibration, and more, with a sensor frame rate of 40k Samples/sec. and linearity of 0.03% FSO (Full Scale Output) accuracy and repeatability are assured. This easy-to-setup precision laser triangulation sensor has a built-in 5 color position indicator making it easy to determine the initial gap setup and for monitoring rudimentary performance during machine maintenance without referring to an external controller.